As an adoptee, trust is a huge giant issue for me. It shows up in every single aspect of my life. I have come to discover “trust issues” rearing their ugly head with everything from myself, to others, to my body, to my environment, to the world. 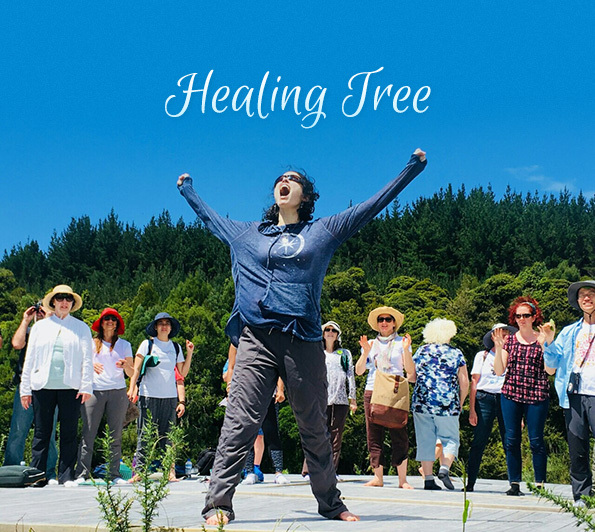 In her most recent comment on Healing Tree, Yvonne posed the question, “How can I trust myself?” That’s a very good question, and not an easy one to answer. I have found that if you try so hard to trust yourself, it’s kind of like staring into a dark hole that just keeps appearing more and more hopeless and impossible, the more you look. The darkness can be enveloping. You cannot find the answer there. Instead, you just keep fighting with your feeling and the feeling keeps growing bigger. The only thing that we can do in those moments is to use all of our strength to recognize that the darkness is not me. The hopelessness is not me. And the feeling of lack of trust is also not me. This means, it’s not the truth of me. In fact, it’s not the truth at all, it’s just a feeling that I have inside. It’s just a feeling. Feelings are like clouds. They come, they go. They get really black and fierce, then eventually they disperse, and the light of the sun is revealed again. The light of truth. If we are simply patient, if we give it time, if we recognize it for what it really is, the light will always be seen again. Please recognize that it’s not that you don’t trust yourself, or others, or whatever the untrusting issue at hand may be. It’s just that you have a feeling of lack of trust inside of you. Again, this is just a feeling, this is not who you really are, nor does it have to be your reality. The reality is, you are a bright shining sun and the clouds of distrust are just covering you temporarily. Try to feel it in your body. Get really familiar with the actual sensations of distrust. Calm your mind and steady your breathing as you examine and observe these sensations in your body. When you do that, you detach yourself from being lost in the stormy clouds, and now you are just observing them with some distance. You can take a good look at your feeling of distrust, and that is when you have made some separation from it. That is very important! It may even be just a momentary separation before you are sucked back into the the whirlwind of darkness that is the feeling of not trusting oneself and one’s surroundings. But, even that moment is powerful for you. Recognize and appreciate it. It’s from that moment that you are on the slow and steady path to gaining some degree of controllability and mastership over the debilitating feeling of self-doubt. This has been my experience with it. In practicing this, it has lead to a reduced feeling of anxiety inside, less irrational fears, improved relationships with loved ones, more feeling of freedom and happiness, an empowered ability to make healthier choices, and a sense of maturity in overcoming the threatened child within. And beyond all of that, it has helped me to connect again more quickly and more deeply with my soul – my true essence – which always brings a sense of healing and peace to my heart. It leaves me with a sense of “inner knowing” that there is the me inside who is always with me, always watching me and can never be injured by a lack of trust. In fact, it feels as if this true nature is trust itself, or at least it is a presence that is void of doubt. It is just Beingness. The work that we have to do is to put in the effort to diligently practice making this separation, to increase the amount of time that we are able to feel our true, pure, original nature. Then we don’t have to try to trust ourselves anymore, because naturally we come to trust that we can handle any feeling, any stormy clouds that come our way. And that is enough. In simple summary, don’t try to trust yourself. Try to become really aware of the sensations in your body when you are in self-doubt or any untrusting moment. Feel it. Separate from it. And slowly you will realize that the self who is able to do this, is a part of yourself that always has been and always will be existing in a place that is beyond the duality of trust and doubt. Beautiful insight! Relationships are built on the foundation of trust. And when that trust is broken, it hurts like hell for sure. But then, comes the real question: how long do we choose to dwell on it? How long before we choose to move on? Trusting someone is in your hands. Keeping or breaking that trust is in theirs. But don’t stop trusting people because someone else proved to be unworthy. It is their karma…not yours. The day you realize that you and you alone have the power to make you happy or sad, you will realize how futile it was to depend on others for the same. Never ever give that power to anyone else but you. Yes, we are humans and yes, we are social beings who enter into unique (good/bad/ugly) relationships throughout our lives. But before others, it is our own relationship with our spiritual self that’s critical, and often reflective of how we wish to be treated by others. Love yourself. Trust your instincts. They say it takes 21 days to make or break a habit. And speaking from personal experience, it does help train your mind if you’re determined. When we do something repeatedly over and over and over again, it becomes a part of who we are. That’s the power of mind. The power lies within us. Gift yourself those 21 days as a start. Like Danielle rightly said, it might just be a moment of peace and positivity in the beginning; but that’s a sign of you reclaiming your life . 21 days…It won’t be easy…but it will be worth it! Thank you Seema. Yes I am a big advocate of 21 day training. Even 100 days…or more…self-development through discipline is also a powerful way of building self-trust. I think the most important part for me personally is not setting a goal for a certain amount of days. Just like Danielle says. It’s about doing it, starting it, practice it and making it a (good!) habit. Thank you Danielle for such a clear description on how to work through the feeling of lack of trust. The principles and training you describe I think can be applied to several other strong negative emotions: fear, anger, and anxiety. Even more to the primal fear of death, fear of our own mortality that has been stamped on the psyche of humanity via the ego for eons. I am still working on this fear and trying to separate from it and once in a while the darkness clears and I get in touch with the Soul who has no such fear. It’s a journey very much in progress. So very insightful, I am not my feelings and my true me is always with me. It’s about knowing I cán trust me (not the how). It’s about expierencing, now about analysing and thinking. I am so very honoured you took the time for this and to adress it directly to me. Once again a reminder that by sharing my thoughts and feelings I can find and get support from others. To reach out to others and ask for what I need. YES! Yes to all 🙂 You can always reach out ~~~ sending lots of love and light to you !!! Sending your way lots of positive vibes, Yvonne! God bless you always!